GSC Game World, the developer behind the original Stalker trilogy, has announced (scroll to end of 'about section) that Stalker 2 is now in development. It confirmed the news via its Facebook account and set up a dedicated game website too. It has been over eight years since the last instalment of Stalker was released - Call of Pripyat. Stalker 2 was announced in the same year (back in 2010) with the aim of a release in 2012 but it never materialised. In 2013 GSC Game World closed down, as studio head Sergiy Grygorovych wished to cease trading due to "personal reasons" which weren't specified. However things must have cleared up, as the firm was brought to life again in 2014. The refreshed GSC Game World announced a new game in 2014 but it wasn't anything to do with the Stalker franchise, it was Cossacks 3, a real-time strategy sequel. 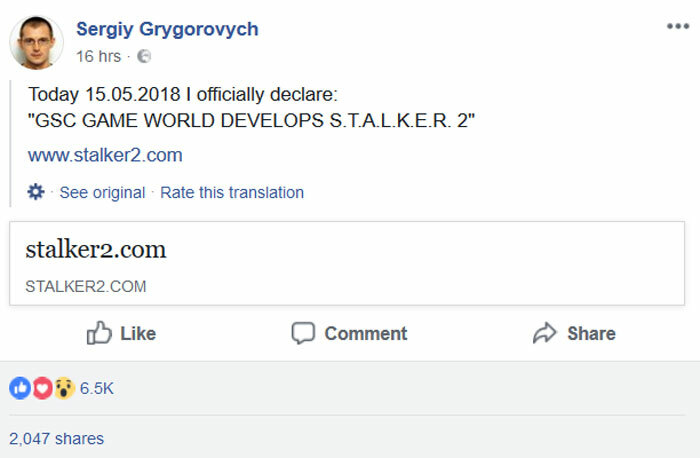 At around the same time GSC Game World complained about an unofficial successor to Stalker which appeared on Kickstarter. The protests were heeded and the crowdfunding ceased due to it violating Kickstarter project policies. There are no videos, screens or artwork to share at this time, other than the website logo art (top). The game is expected to be cast in the same mould as the original trilogy - a first person open world shooter set around Chernobyl. The previous games were PC exclusives but Stalker 2 could easily be multiplatform as it is expected to be built on the Unreal Engine. Great excuse for me to finally play the first STALKER…!! Woops, now I have to play the first lot. But this could be so good.